编码： 9781597020053. 分类： Bestsellers, Children's Fiction. The Octonauts are a crew of adorable animals who roam the ocean in search of adventure, treasure, and fun! 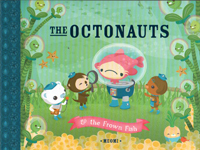 From their undersea base called “the Octopod,” the Octonauts explore a colorful world full of thrills, chills, and gills! These eight talented critters, including a brainy octopus, brave polar bear, daredevil kitten, and scientific sea otter, are always ready to embark on a new, exciting voyage.